Letter: An easy solution to police violence? 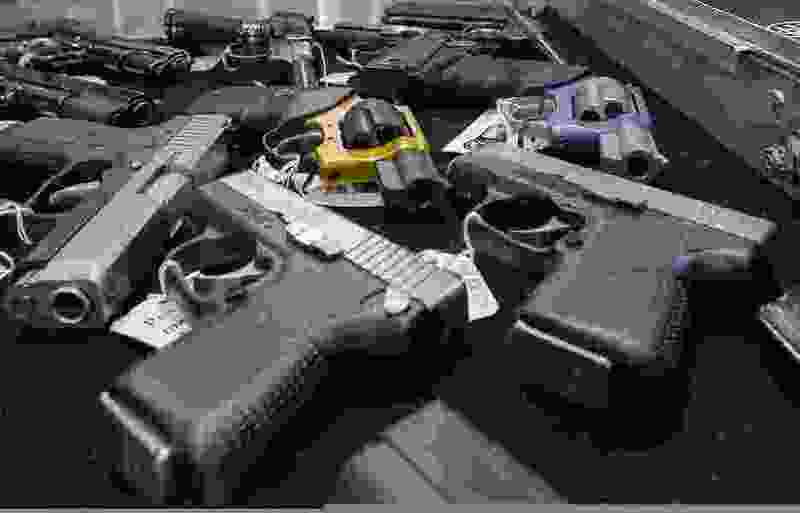 (Philip Kamrass | The Associated Press) In this Jan. 26, 2013, file photo, handguns are displayed on a vendor's table at an annual gun show in Albany, N.Y. In a study looking at data from 2006-14, serious gun injuries including many from assaults sent 75,000 U.S. children and teens to emergency rooms over the nine years. Results were released on Monday, Oct. 29, 2018. Amid all the introspection on recent police shootings, it is a bit ironic that all the focus is on the police officers themselves. However, in all of the confrontations there was a violent person, armed with a lethal weapon, threatening the police or another person with deadly results. Hmm, what to do? Well, how about teachers and parents everywhere teach their children to do exactly what the cops tell them to do? No delays, no dramatic speeches, no threatening moves…just do what the police tell you. Feel like you’ve been treated unfairly? File a complaint later; just follow their instructions now. But what to do about violent criminals and the mentally ill? There are no quick, easy solutions. Police try talking the person down, de-escalating the situation, releasing hostages, tear gas, tasers, etc. These methods usually work, but don’t get the headlines that a shooting gets, or rallies in support of the police. Use of a firearm is, in fact, their last resort.